The Hadrosaurus is special because it was the first dinosaur found in the U.S. officially recognized as a dinosaur by science. A man in Haddonfield, New Jersey found some bones in 1838 near his home. He didn’t know what they were from but he thought they were interesting. He used some of them to decorate his home. Scientist William Parker Foulke saw the bones and dug up the rest of them. He showed them to paleontologist Joseph Leidy who identified them as dinosaur bones because they were similar to the bones of Iguanadon, which had been discovered in England. The Hadrosaurus is a duck-billed dinosaur. It lived during the Late Cretaceous, 79 million years ago, and grew 25 feet from nose to tail. This dinosaur’s name means “bulky lizard.” Its species name is after Foulke, who discovered it. The Hadrosaurus skeleton was mounted and put on display in 1868 at the Philadelphia Academy of Natural Sciences. This was the first time a skeleton had been displayed this way. Because the skull was never found, scientists made a plaster skull similar to a modern iguana. A skull has never been found, but this dinosaur probably had a flattened beak like those of its Hadrosaur relatives. New Jersey was the first state to declare a state fossil/dinosaur. Question: Have scientists found other Hadrosaur fossils? Answer: No. Foulke’s fossils are the only ones ever discovered. Because of this, we still have a lot to learn about it. We do know that it was as big as an Asian elephant and was probably an herbivore. Watch videos and learn more about how this dinosaur was discovered. Declan, Tobin. " 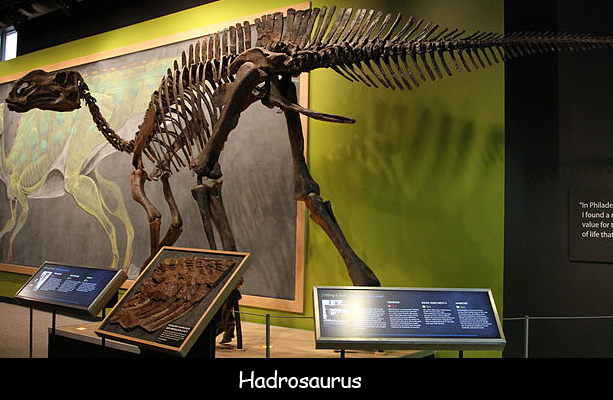 All Hadrosaurus Facts for Kids ." Easy Science for Kids, Apr 2019. Web. 21 Apr 2019. < https://easyscienceforkids.com/hadrosaurus/ >.